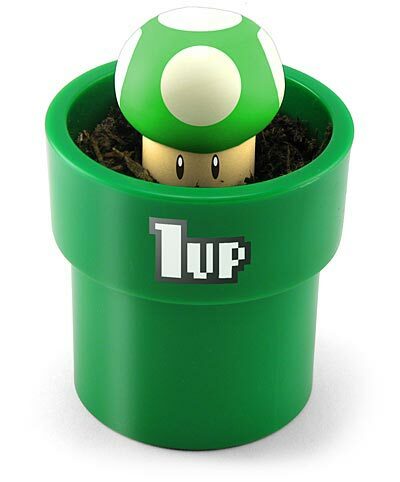 Now your can grow your very own 1up Mushroom. The instructions are pretty simple. All you do is add potting soil to the green sewer-pipe-shaped flower pot, and push the spores deep into it. Soak the soil with water using the dropper, add a squirt of the food solution, and then it’s off to a dark location for a few weeks. We’re letting you in on a little secret here… the Grow Your Own 1Up Mushroom is really a vinyl collectable that does not actually grow. By adding your own soil, you create the illusion that it has grown from the pot. But don’t worry your friends will be fooled. The Grow Your Own 1Up Mushroom does not come with any soil. You need to provide your own. It can be found on the ground, generally outdoors.